It is a crazy thing, a bucket list. You think about the things that you want to do, to accomplish. It is a list of the things you dream about doing, people you want to meet, places you want to go, goals you want to hit. My list isn’t written down, it just floats about in my thoughts. It has been added to, edited, tweaked, revamped, added to again, and some (very few) items have been checked off. Some of the items on my bucket list are: setting my feet upon every continent, visiting every one of the 50 states, running a half-marathon (check! ), riding in a hot-air balloon, opening/running a B&B with a spa, learning how to cook a whole chicken (okay, so some of my dreams aren’t very big! ), and living to see all of my children graduate, get married, and meet my grandbabies. That one is just about ready to be checked off. Back in January, I signed up to run in the Mankato Marathon. I’ve spent the last nine months, hours upon hours, training, running, focusing on accomplishing this goal. For nine months, I’ve been a bit obsessed over training plans, calendars, carbohydrates, and fueling. For nine months, I have told everyone I know that I am going to do this, and probably annoyed everyone around me with talk of it. For nine months, I have sacrificed almost every Saturday morning to spend running for 3, 4, and sometimes, 5 hours. And now, in just 9 days, I will put my feet at the starting line, and push forward with 1,500 other men and women to run for 26.2 miles, up and down hills, through long straights and sharp curves, all for the right to say I’m a marathoner. But it is going to be ugly. That I already know. I live currently in a very, very flat part of the state. Mankato? Not. flat. at. all. It’s going to hurt. It is going to be hard. My goal? To finish. My other goal? To finish under the 6 hour, 15 minute time limit allotted for the race. Long past after most of the other 1,500 runners finish. Fast? No. But finishing? That is what is important to me. I’ve never been a fast runner, never been much of a runner at all. In fact, I still have a hard time calling myself a runner, even after finishing a half-marathon, a 7 miler, a 10K, and a couple of 5K races. But I am stubborn, determined to finish what I start. Of course, I would love to finish in less that 5 hours (definitely not going to happen). I’d be thrilled to finish in less that 5 1/2 hours (probably not going to happen, either). 6 hours, 15 minutes, the time limit allotted? Hopefully, I will finish in less time than that. I am hoping I won’t be the last person to cross the finish line. And there is fear, too. Fear that I can’t push through, fear that when it gets hard, when I lag behind the crowds, that I may just want to fold up and quit. Other than having babies, there is nothing else that I have committed 9 months in preparation for. But you can’t quit in the middle of labor. Running? There is an out. It hurts? I can quit at any time. There is nothing that commits me to finishing, other than my own mental fortitude. Nothing forcing me to follow through, except for myself. I have been thinking through how I am going to deal with it when the pain starts, when the fatigue sets in. 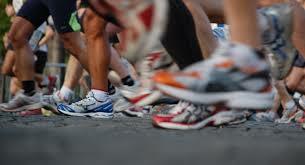 Having read plenty of articles about running a marathon, I know there will come a time when I hit a wall, when the carbs from breakfast are used up, when the energy stores run low, when the blood sugar crashes, when it will get hard. My plan when it gets hard? To focus outside of myself. I have started a list of people I want to think of, pray for, when it starts to get tough. Each mile of this race, I want to dedicate to a loved one, some who are still here, some who have passed on. I’m making a mental list, but I am pretty sure I will need to write it down before race day. Who knows what my mental processes will be like by mid-race, and I want to make sure I don’t forget anyone. My nephew with a heart defect, who has been through multiple surgeries, and who still needs a miracle. My father in law, who passed away several years ago from cancer. My husband’s great-grandma, almost 102, and my baby girl, almost 4. My children. My husband. My family of origin. My family I have been blessed to marry into. My friends who are like family. Sweet friends who are mourning the loss of their first pregnancy. Other friends who are mourning the loss of their parents. The list is long already, and growing. Each mile will have a focus, and every mile will be special. The names will be written on my arm, and tattooed upon my heart. They will be carried with me over every mile, and they will carry me in every way. This is how I will get through the (literal) ups and downs of this race, by turning outward rather than inward, by thinking and focusing on what is greater than me, and the One who is greater than me. And that finish line? It really doesn’t matter how long it takes me to cross it. Running, walking, stumbling, or perhaps even crawling….I just gotta cross it.